The morning after the storm saw a clear, blue sky, radiant in its beauty, the air was crisp with just a hint of movement, providing an auspicious canopy for the mountains and fields. Another glorious winter’s day in the Midlands of Tasmania. There was no hint of the disruption of the night before, as pilots braced themselves for bumpy landings and drivers wandered between lanes unable to determine the road markings in the glow of the headlights and raindrops bouncing off the asphalt. This sort of weather is not peculiar for an island state as the winds blow and the climate changes sometimes on an hourly basis. I have fond memories of mornings like these rising early to walk in the stillness of mist with blue above me. The valleys full of green rolling fields falling away from the side of the road, in front of me were the impressive Western Tiers and further up, their crowning jewel the Great Lakes. In winter I remember waking up some mornings, looking up to the mountains and seeing their tops shrouded in the most beautiful white powder. On those mornings despite the cold there was a quiet reverence about the village, a collective awe. Only to be broken by a ute full of young adventurers who would bring the snow down to us via the bonnet of their vehicle. This weekend Amy and I have ventured back to Tasmania to catch up with old friends as well as explore places we missed during our three and half year stay in Poatina. As I write we are getting ready to drive up to the village. Such a beautiful place yet a place full of old emotions, hopes, ambitions, memories and pain. For the uninitiated Poatina began life as a hydro town, housing workers that built the massive infrastructure to supply hydro electricity to parts of Tasmania. 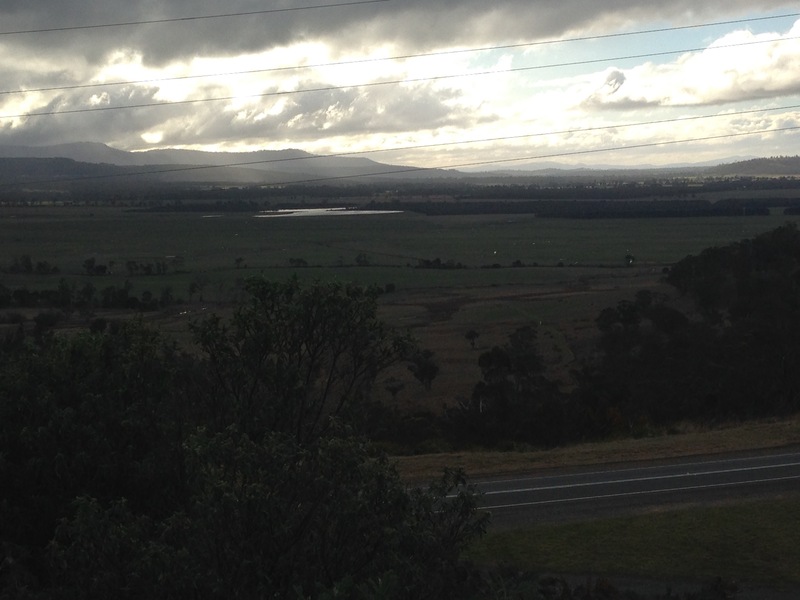 The giant pipeline which is a central feature of the work, now looks like a scar down the middle of the western tiers. As the infrastructure was finished, and the workers moved away the town became somewhat obsolete and so was put up for sale. There were a couple of other interested parties, but through a miraculous turn of events, Fusion Australia a Christian youth and community organisation was able to purchase the town. It’s purpose for purchasing was to create an intentional community to care for at risk young people. As well it was to be the national headquarters for the movement and a place of training for workers. We moved into the village when much of this was already established. There was a youth program, which included giving young people the opportunity to begin study in various trades as well as being cared for by the loving embrace of a community concerned to see them succeed. We came to do Fusion’s training having already been working with the movement in South Australia. As we arrived in the village it didn’t take us long to realise the hive of activity that would soon envelope us. There were rosters for the various businesses, people involved in maintaining and developing the infrastructure. Another circle connected to training. The national operations of Fusion had an office complex in the village, many of those guys looking serious and official, there was a communications hub and so on and so forth. Quite the thriving community yet with all the pretence of a quiet sleepy town. Reflecting back on my experience in Poatina, despite our training that sort to push us in an alternate direction, the town consisted of a very driven community. As part of the youth program Amy, Josh and I were a first port of call for young people coming to the village, helping them transition to a more independent lifestyle. I filled rosters at the chalet, both in the kitchen and front of house, I worked the shop, sometimes the garage (just serving, I wouldn’t haven’t trusted me to even help with any of the mechanics), completed Fusion’s diploma, helped to establish the radio station and filled many on air shifts, helped establish and was the manager of an evening cafe on a Friday and Saturday night, was on the village management group, helped with an introductory training course in Launceston and ended up provisionally managing the work in Launceston for a short period. All this in three and a half years. Looking back after the experience in Poatina I felt I got caught up in the machinery of the village, I suspect most of us did. Much to my growing chagrin I wanted a big role, a role I considered important, which pointed to leadership. I feel now I missed a lot of things because of that ambition and what I needed to do, to feed it. I think about the young people that came through our house, how present was I for them? Could I have done more with them? Played, just been available? I’m not going to beat myself up too hard about that, but as perspectives grow and change, I see what’s truly important a little differently. We came to the village as students and as such it took time to build relationships with the permanent residents, who saw many such groups come and go. Even so whilst a common task of sorts bound us together due to busyness and a lack of emphasis from senior leadership there was surprisingly little deep connection between people, particularly between people in different circles. We have a number of great enduring relationships from that period, yet there could have been so much more. Don’t get me wrong there was fun and laughter along the way, but surprisingly little deep connection. The training we received for the most part was excellent, some of the books we examined shaped my thinking considerably into the future. The lecturers knew their material and for the most part delivered it well. There was plenty of chance for interaction and questioning. The classes were made up of people exploring their hopes and dreams, longing essentially for a better world. On the whole Poatina provided a great community for people to explore a particular model of youth and community work. Yet it was driven and looking back there was much done for the sake of doing it. As much as there was freedom to explore as I got more involved in the work, decisions tended to be unilateral and there was very little room to input new ideas, even those being looked at in the training. I struggled to leave for 18 months, I struggled with frustration over not being seen and heard, I struggled with new ideas that found no expression, I struggled with Amy about what it meant to leave well and in God’s will… I struggled. And so 11 years on it was interesting to visit the community once again. I think we’ve been back once in that time but on this visit a very different Poatina presented itself to us. The infrastructure was the same, the community hall, chalet, all the houses, the streets. The view was still spectacular, the mountains behind and valleys on the other three sides. Yet a great deal of the driveness was gone, it was quiet and to the outside observer almost peaceful. Again though if you dig deeper a different story emerges. Five years ago events took place that changed the shape of the community. The senior leader of Fusion was asked to leave due to inappropriate behaviour, this sent the movement generally and the village particularly into a tailspin. Many of the Fusion people finished up with the movement, hurt and disillusioned, others not of the Fusion ilk moved into the village to join the community and today there is somewhat of an ‘us and them feel.’ Those not connected to Fusion are reluctant to respond positively to most initiatives that feel top down and those who still work with the movement tend to be the ones holding all the infrastructure together. I believe in the power of intentional community, when a group of people come together to live, and respond to some sense of common cause outside themselves that ultimately unites them. It seems to me to be a great reflection of what the Church could be. They are notoriously hard work, fraught with danger, yet there is something in their genesis which I believe is part of the restoration that the world needs. They require commitment, sacrifice and are counter cultural in the extreme. Could Poatina once again take its place in this journey? There needs to be a lot of dialogue, a lot of forgiveness and the beginnings of a new dream shared by all in the community. However I need to believe it is possible, not just for Poatina but other intentional communities in the cities where we live… they just might be a core solution to so many of the issues we see around us everyday. ← Reclaiming What, For Whom?